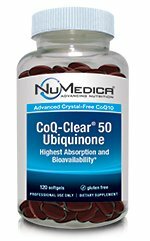 CoQ-Clear is a patent-pending, crystal-free CoQ10 offering the highest absorption and bioavailability. CoQ-Clear has been shown in clinical trials to be over eight times more absorbable than powdered CoQ­­10 and more than twice as bioavailable as other oil-based or so-called "Nano"-dispersed formulas on the market. CoQ-Clear's proprietary monoglyceride carrier is a patent-pending formulation that is unmatched for optimal utilization in the support of cardiovascular and energy-based health needs. If you have any questions about this product by NuMedica, contact us by completing and submitting the form below. If you are looking for a specif part number, please include it with your message.